On November 4, 1979, shouts of “death to America” and “death to the Shah” roared from the streets of Tehran. Outside the American embassy throngs of radical Iranian students pushed against the embassies’ walls shouting in visceral disgust at the American diplomats inside. 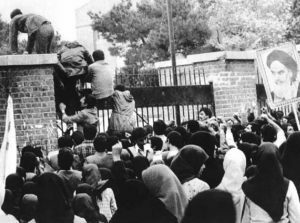 It wasn’t long before these students brazenly scaled the walls and stormed the embassy. In the harrowing hours after the American embassy was overrun, fifty-two Americans were taken hostage. They were paraded before cameras and broadcasted around the world by international news outlets. Ayatollah Khomeini, leader of the Iranian Revolution which overthrew the Shah’s rule, refused to release the American hostages. They remained captive until January 20, 1981 when President Ronald Reagan was inaugurated. For 444 days, Americans were kept in captivity, and the United States fumed with justifiable anger, resentment, and confusion. How could an event like this happen? 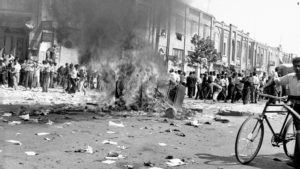 What were the roots of the crisis in Tehran? In his 2003 book, “All the Shah’s Men: An American Coup and the Roots of Middle East Terror”, Stephen Kinzer attempts to lay the groundwork for an explanation. The story of how America became heavily involved in a plot to overthrow Iranian Prime Minister Mohammed Mossadegh represents a fascinating chapter in American history, and one that is frequently overlooked and sadly misunderstood. “All the Shah’s Men” provides a broad overview of Iranian history to set the stage for Iran’s present-day resentment and mistrust of foreign powers. Mr. Kinzer harkens back to the era of the Persian empire “built by Cyrus, Darius, and Xerxes” and remarks that Iranians possess an abiding sense of inspiration in “their heritage” (Kinzer 17-18). 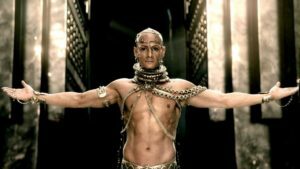 He also talks about the collective social consciousness and sense of justice that can be traced to the influence of Zoroastrianism in Persian history. At the same time, Kinzer underscores the fact that Iranian pride in their history and culture is also deeply rooted in their opposition to hostile invaders to include Alexander the Great, Genghis Khan’s Mongol hordes, and Arab conquerors, who spread Islam to Iran. Furthermore, the form of Islam adopted by Iranians would be Shiite, which is a tradition rooted in the belief that Mohammad’s cousin Ali was the successor as caliph i.e. leader of the Islamic world. During the first quarter of the 20th century, Iran was ruled by a Turkic tribe known as the Qajars. When the Qajars were gone after 1925, Iran stood between “two great imperial powers, Britain and Russia” (Kinzer 28). Due to this position, Iran found itself within the crosshairs of world powers competing for ideological partners and foreign allies in the aftermath of World War II. A significant portion of Mr. Kinzer’s book involves the rise of Iranian nationalism embodied in the figure of Mohammad Mossadegh. Mossadegh rallied his political support under the banner of opposition to the Anglo-Iranian Oil Company. This was a British oil company located in Abadan on the Persian Gulf, and the British made no apologies about the conditions in which Iranian laborers worked and the paltry royalties which the Iranian government received from the company. 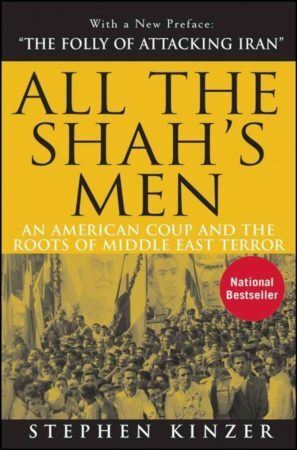 “All the Shah’s Men” dives deep into the divisions and lack of compromise between the Anglo-Iranian Oil Company and Iranian nationalists like Mossadegh. 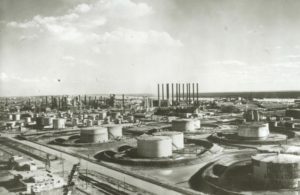 Mr. Kinzer suggests that the British maintained a colonial attitude that ruled out the idea of profit sharing or concessions to the Iranian government such as the ability to audit the company. The conflict between the British and Iranians brought the US deeper into the region and Middle Eastern affairs. Under President Harry Truman, the US had been an impartial arbiter in the conflict, and often urged Anglo-Iranian Oil to make concessions. However, events changed when President Eisenhower took office in 1953. President Truman tried to walk a fine line in the conflict. His diplomatic envoys were clearly frustrated with both sides unwillingness to compromise. The US watched their British allies overplay their hands in Iran until Mossadegh’s government nationalized the oil industry. Eventually, the British were expelled from Iran altogether. This did not stop them from maintaining their strategic patience, and applying the full weight of their economic power to squeeze the nascent Iranian oil industry out of world markets, which proved to be much easier than it would be for the US to attempt in the late 2000s. As Winston Churchill was re-elected British prime minister, there were even whispers of military action. However, military intervention never transpired. Instead, the election of Dwight D. Eisenhower opened a new window of opportunity for British interests in Iran. To the extent that Eisenhower’s election fostered renewed British hope to overthrow Mossadegh, it was not due to anything that President Eisenhower said or believed about Iran prior to him assuming office. 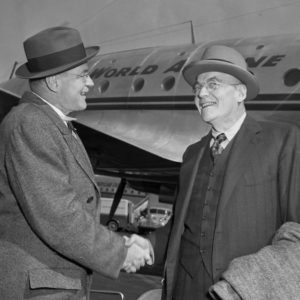 On the other hand, the Dulles brothers entered Washington as part of the new administration with John Foster Dulles as Secretary of State, and his brother Allen Dulles serving as Director of Central Intelligence. Mr. Kinzer asserts that the Dulles brothers’ worldview was shaped by the ideological conflict of the Cold War. They were the practitioners of a Soviet containment strategy that relied on intervention in countries which they saw as vulnerable to falling into the orbit of the Soviet Empire. Their first project was Iran. Mr. Kinzer absolves President Eisenhower of much of the decision-making and responsibility for the 1953 coup. Instead, he sees the Dulles brothers as the principle architects. In terms of execution of the coup, the book digs into a CIA operative by the name of Kermit Roosevelt, a grandson of Theodore Roosevelt. In a CIA mission called Operation Ajax, Roosevelt, a savvy, Middle East operative, charged forward with the plan to oust Mossadegh. Mr. Kinzer provides some details into how Roosevelt cut deals, paid mobs, and pulled at the delicate fringes of Iran’s political fault lines to make the coup a success. After paid civilians lay dead outside Mossadegh’s residence, Mr. Kinzer notes that they were “found with 500-rial notes still in their pockets,” which had been given to them through Roosevelt’s dozens of subagents (Kinzer 187). While the events of the coup are well documented, Mr. Kinzer’s narrative lacks some pertinent details. He merely suggests that after nationalizing the oil industry Iran was left in an isolated economic situation, which created political unrest. But, this is an area that I felt needed more focus. There is a sharp transition from when the British leave, Iranian nationalism soars, and Mossadegh’s popularity seems well-established to Roosevelt and the CIA overthrowing the government literally in a single night. Although Roosevelt’s initial attempt at the coup failed, he gambled again and succeeded the second time. I wanted to read more about the shifting political situation in Iran. I also found myself wondering how Roosevelt had built a sophisticated network of agents that could allow him to mobilize a coup in one night. Somehow Roosevelt made it all happen as planned. As a result, Mohammad Reza Shah ruled the country for twenty-five years, and former prime minister Mossadegh spent his remaining years under house arrest. The preface to Mr. Kinzer’s 2008 edition of “All the Shah’s Men” addresses what he calls the “folly of attacking Iran.” He wrote the preface in response to talk that existed in the Bush Administration and Defense Department about using military force against Iran. This was when Iran was under the leadership of Mahmoud Ahmadinejad, who was notoriously anti-Western and had even harsher opinions toward Israel. Mr. Kinzer’s conclusions are relevant in today’s political environment as Iran has been put “on notice” by the current administration. President Trump and has called Iran a state sponsor of terrorism. Ironically, President Trump has also reinstated a bust of Winston Churchill in the oval office. But, considering the 2015 US-Iran nuclear deal and Iran’s re-election of moderate President Hassan Rouhani, Mr. Kinzer’s assertion that “there are a remarkable number of areas in which the United States and Iran might find common ground” should be taken seriously (Kinzer xix). His contention that the overthrow of Prime Minister Mossadegh was a long-term strategic disaster comes through poignantly in his book, and it informs Mr. Kinzer’s policy stance towards Iran as being much less hawkish than the prevailing wisdom in Washington. “All the Shah’s Men” is a fast-paced read. The history is interesting, and Mr. Kinzer’s writing style is captivating. This book could have been a lot longer, and readers who want more details on the Shah’s rule and the events leading to the revolution of 1979 will not find much here. But, Mr. Kinzer covers a lot of ground and illuminates a moment in history that continues to affect US foreign policy. It is unclear whether lessons have been learned from this period in history. There are members of the National Security Council (NSC) such as Ezra Cohen-Watnick, the council’s senior director for intelligence, who have urged the use of CIA spies to try to do the same thing Roosevelt accomplished in 1953. But, these NSC members would be wise to recall the fact that twenty-five years after Roosevelt’s operation, Tehran’s streets teemed with chants of “death to America” prior to the American embassy being overrun. Will a second coup work? The historical record must be considered. For Mr. Kinzer’s part, his contribution to this record is powerful, and he concludes unequivocally that the 1953 coup “brought immeasurable tragedy to Iran, contributed to the rise of anti-American terror, and, in the end, greatly weakened the security of the United States” (Kinzer xxiii). 1. Kinzer, Stephen. All the Shah’s Men. Hoboken, NJ, John Wiley and Sons, Inc., 2008.